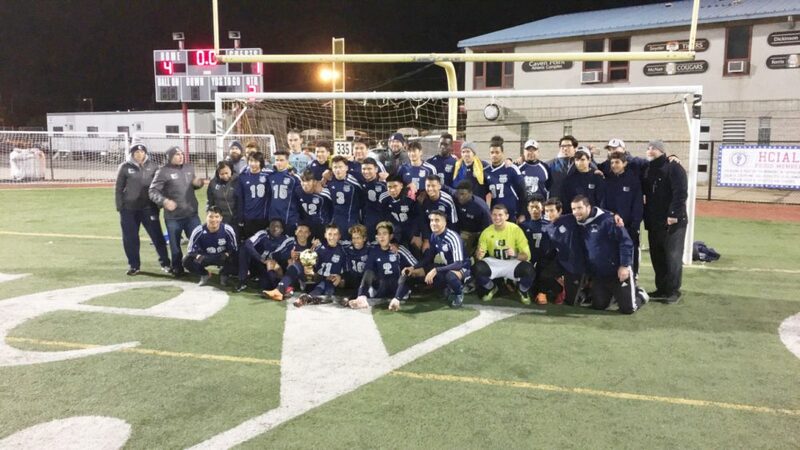 COUNTY CHAMPS, FINALLY – The Union City boys’ soccer team finally captured a Hudson County Tournament championship, defeating Harrison, 4-1, in the title game at Caven Point Cochrane Stadium Oct. 25. Just about a decade ago, the Union City Board of Education decided to consolidate the district’s two existing high schools, namely the old Emerson and Union Hill High Schools, into one high school covering the entire town. At the time, it was generally believed that the end result would be one dominant, one powerhouse of an athletic program, especially when it came to the sport that the town was perennially strong in anyway – namely boys’ soccer. It was generally assumed that the new-fangled Union City High would evolve into a soccer megapower, an unbeatable juggernaut ready to take on any and all comers. But that wasn’t necessarily the case. “Hudson County is not a soft county,” said Bill Shapiro, who was brought in from Sussex County 10 years ago to be the wizard that was going to take on the task of unifying the United Nations of high school soccer and actually hope and pray that the kids from all the different ethnic backgrounds — not to mention the two former schools – could actually coexist and function as one. Just how diverse were the Soaring Eagles in soccer? Well, take the 2018 version of the Union City boys’ soccer team as an example. The starting 11 for the Soaring Eagles come from seven different countries. There are representatives from Hungary and Senegal. Just that pairing alone is bizarre. What other team in New Jersey proudly displays players whose families’ roots are entrenched from two more different nations than that? Then, there are the Central and South American connections. There are players from Ecuador, El Salvador, Peru, Venezuela and Mexico. It’s truly a collection worthy of the United Nations, one that would have kept people like Dag Hammarskjold and Boutros Boutros-Ghali on their toes as Secretary Generals of the UN. There is no need for translators with earpieces and communication breakdowns like what transpires in the UN’s General Assembly. When Shapiro speaks, there isn’t a necessity to bring in six different language masters to speak to each and every player on their own different levels. They all speak one universal language, which is soccer. Coming together as one solid unit from all different backgrounds may seem like an easy task on paper, but in reality, it was a tough road to hoe. The Soaring Eagles may have enjoyed some sort of a level of success, but never captured the grand prize – namely the Hudson County championship. Twice before, in 2011 and again in 2015, the Soaring Eagles reached the championship game, but lost. On Thursday, Oct. 24, the Soaring Eagles were back in the title game, this time facing Harrison. “Maybe the third time was going to be a charm,” Shapiro said. Fellow senior Randol Ramirez agreed. Ramirez never played high school soccer prior to this season. He was determined to go out with the school’s first-ever county title. Sure enough, that’s what they did. Fellow senior Erick Chicas, who spent the last two seasons playing for different soccer academies than playing for the Soaring Eagles, continued his brilliant season, scoring two goals and adding an assist. Junior midfielder Johnathan Romero tallied a goal and collected an assist, Ramirez scored his first goal of the season and Altamura added an assist, leading the Soaring Eagles to the elusive county crown, defeating Harrison, 4-1, at Caven Point Cochrane Stadium in Jersey City. Shapiro said that his team didn’t know how to act or react after finally winning. Shapiro said that the Soaring Eagles didn’t focus on the opposition and Harrison’s dangerous All-State striker Omar Sowe, considered by many to be the best goal-scoring striker in New Jersey. Well, maybe, just maybe, the best goal scorer resides in Union City, as Chicas now has an incredible 31 goals this season. The Soaring Eagles defeated St. Peter’s Prep, 4-1, in the semifinal and then defeated Harrison by the same score in the title game as week later. The rest of the state may be taking notice, as the Soaring Eagles won their first NJSIAA state playoff game, defeating Bloomfield, 4-1 (maybe this is becoming a trend, this 4-1 outcome), in the opening round of the North Jersey Section 1, Group IV playoffs Oct. 29, setting up a quarterfinal showdown with Passaic on Nov. 1. Union City High School has been around for 10 years. Maybe it’s time for everyone around the state to take notice of the Soaring Eagles in their flight toward an elusive state title, now that the county crown has finally been secured.